Home Fleet Van FIRST DRIVE – Renault MASTER Z.E. FIRST DRIVE – Renault MASTER Z.E. Renault Pro+ is broadening its range of electric LCVs with the introduction of the Master Z.E. large-size electric van, deemed as an ideal workhorse for emissions-free access to city centres. As city authorities continue to push for cleaner air in the urban environment, Master Z.E. is best suited to last-mile deliveries. Master Z.E. benefits from the know-how of Renault – Europe’s leader in developing and selling electric vehicles: a new-generation battery and a high energy efficiency engine give it a 120km real-world driving range and a charging time appropriate to its duties (fully charged in just 6 hours). Master Z.E. offers many of the tailor-made solutions available from a large number of versions to a dedicated dealer network and made-to-measure conversions. Renault Pro+ is working with the biggest names in fleet management to offer a broad range of services and meet business users’ widest range of needs.“With Master Z.E., Renault Pro+ is enlarging its e-LCV line-up consistent with the “Drive the Future” strategic plan, in which 100% of vans will be electrified. The current line-up, ranging from quadricycles to heavy vans, covers the main needs of business customers in terms of cargo volume and payload, enabling them to make emissions-free last-mile deliveries in city centres. In addition, a new ecosystem of connected services has been rolled out to improve fleet management and help customers to grow their businesses,” stated Ashwani Gupta – SVP, LCV Business Unit, Renault-Nissan at the first drive event in Lisbon. “Groupe Renault continues to implement its electric-vehicle growth strategy by strengthening its coverage of key market segments. The launch of Master Z.E. meets the needs of professionals to adapt to urban environmental issues. Master Z.E. is a further proof of the expertise of Renault, the European leader in electric vehicles,” added Gilles Normand – SVP, Head of the Electric Vehicles Business Unit. When it comes to driving the Master Z.E. it is in many ways similar to its smaller brother, the well proven electric Kangoo Z.E. There is instant torque from the motor, delivering a fairly brisk performance off the line. With the 33kWh battery pack mounted underneath the floor of the van, the reduced centre of gravity means it holds the road much better. The obvious difference is the size, but despite the larger footprint and greater weight, the 57kW motor that powers both models feels just as capable in the Master van. With a 400kg payload on board, we covered more than 60 km of mixed urban and dual carriageway roads. The result was a less than 40% drop on the dashboard’s range indicator suggesting that the real-world driving figure of 120 km is more than achievable in the right circumstances. At low speeds the Master produces an artificial noise to warn vulnerable road users of the approaching EV, but at speeds above 50 km/h it is a tranquil experience. Road and tyre noise suddenly become extremely noticeable, while wind wrapping itself around the mirrors and A-pillars is far more evident in the Master Z.E. than in the Kangoo Z.E. With a better distribution of weight across the vehicle than in a front-heavy diesel-powered model, ride comfort is slightly improved. While sizeable payloads in the rear would normally counteract this, the lighter weight, volume work Renault is expecting the Master Z.E. to be used for, means it is a more planted and secure ride. Top speed is limited to just 100 kp/h and the Master Z.E. isn’t particularly fast getting there either, and it is even slower with the Eco mode button enabled. The Master Z.E. is then limited to 80 kp/h with noticeably slower acceleration, but in a city environment it is ideally suited to the characteristics of electric driving. 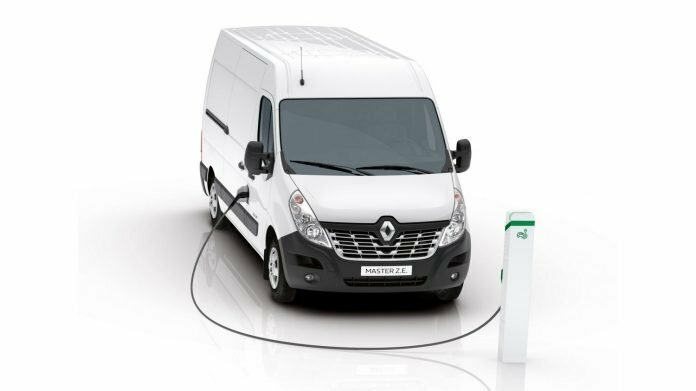 Electric vans are the next battle ground for manufacturers in the large van sector; thanks to the Kangoo Z.E. and the Master Z.E. Renault Pro+ is ahead of the game and in a commanding position.